The RegenaMax® treatment was developed to help patients suffering from inflammation and chronic pain. The science of regenerative medicine focuses on stimulating the body’s own natural ability to heal and regenerate. RegenaMax® may offer hope for patients suffering from the signs and symptoms of inflammation and injury. This results in a natural, non-surgical, and long-lasting solution in a simple injection form. RegenaMax® is a sterile, acellular, protein based biologic made from 771 proteins, cytokines, and growth factors. These nutrients are necessary for cell function, overall health, and homeostasis. When injected at the source of pain or injury, these nutrients can help to reduce pain and inflammation, and stimulate the body’s natural ability to heal, repair, and regenerate. 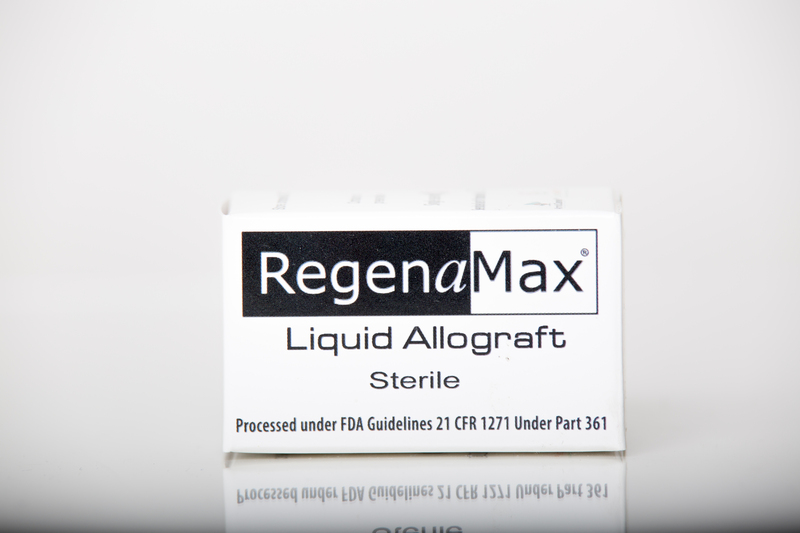 RegenaMax® is made utilizing our Sterile D-MAPPS™ platform technology. This technology is engineered to stimulate stem cell communication without cell to cell contact. All cytokines have multiple functions and multiple target cells, as well as shared activities. When secreted in normal amounts, cytokines are important in normal homeostasis; when introduced in larger amounts, cytokines are important in cell recruitment, cell differentiation, and inflammation, all necessary in the healing process. Anti-inflammatory cytokines help to reduce inflammation. Growth factors aid in healing and regeneration. Hyaluronic acid helps to lubricate and protect. RegenaMax® contains contains 771 naturally occurring proteins, cytokines, and growth factors such as VEGF, TGFβ1, TGFβ3, EGF, HC-HA/PTX-C.PTX-3 (Pentraxin 3), IL-1Ra , PDGF, ST2, bFGF, KGF, Collagen Types I, III, IV, V and GDF11. RegenaMax® is prepared using our proprietary patent protected processes to ensure the safety, bioactivity, sterility, and preservation of the product. Every lot of RegenaMax® is issued a “Certificate of Sterility” by a licensed testing laboratory and a “Certificate of Analysis” that documents the quality and safety of RegenaMax®. RegenaMax® is registered and regulated by the FDA under 21 CFR Part 1271 & PHS Act Section 361. We recommend administering RegenaMax® using the same techniques and methods as a steroid injection. We recommend using a C-arm for spine, fluoroscopy for joints, and ultrasound/doppler for nerve pain injections.